Saini N*, Chauhan AR**, Paghdiwalla K**. (* Third Year Resident, ** Honorary Consultant, Saifee Hospital, Mumbai, India). Torsion of adnexa may present as acute abdominal pain in the reproductive age group. Torsion of ovarian masses are common, but isolated torsion of paraovarian cyst is rare. If timely diagnosis and intervention are not done, it can lead to irreversible damage to the ipsilateral tube and ovary. We report a case of a twisted paraovarian cyst in a 33-year-old female causing acute abdominal pain, which was managed laparoscopically. Parovarian cysts represent approximately 5% of adnexal cysts. Most of them are the vestigial remnants of Wolffian duct in the mesosalpinx or arise from mesothelium of the broad ligament or from tubal epithelium. These cysts are unilocular, the wall is thin and they contain clear fluid. They are mostly small and asymptomatic but occasionally they become large enough to cause acute pain in abdomen. 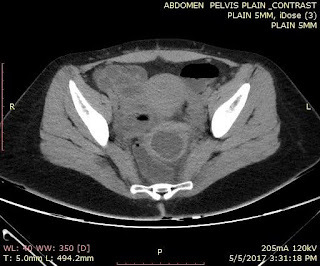 Physicians need to maintain a high index of suspicion for this rare and difficult to diagnose cause of pain abdomen. They are difficult to be differentiated from ovarian cysts on imaging. They should be surgically removed and if possible, fallopian tube and ovary should be preserved. Complications include torsion, rupture, hemorrhage, secondary infection and neoplastic transformation. We present a case of paraovarian cyst torsion with two twists which presented as a mass in the pouch of Douglas (POD). 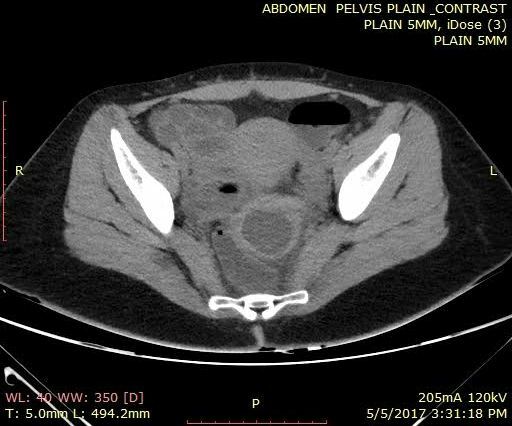 A 33-year-old female para 1 living 1, previous LSCS, married for 5 years presented with complaints of sudden onset pain in lower abdomen and vomiting 1-2 episodes since 2 days. The pain was sharp, non-radiating and was relieved on giving analgesics. There was no history of fever, abnormal vaginal bleeding, altered bowel or bladder habits or any other illness. Her last menstrual period was 20 days ago, and was scanty. On examination, patient was well oriented, afebrile, pulse and blood pressure were normal, no pallor or any signs of dehydration were seen; rest of the systemic examination was normal. Per abdomen, there was tenderness in the hypogastrium, no guarding or rigidity, and no palpable lump was felt. Speculum examination was normal. On per vaginal examination, a mass of 4 -5 cm diameter was felt in posterior fornix, which was smooth, firm and tender. Uterus was anteverted and normal size. Our initial impression was ovarian cyst torsion or ectopic pregnancy. Her blood counts and urine investigations were within normal limits, and β HCG was within the non-pregnant range. Her first USG revealed a hypoechoic lesion of about 4 cm diameter in the pouch of Douglas, with low level internal echoes suggestive of endometrioma. Ca-125 was 11 U/ml (normal). As the clinical picture and her severe pain was discordant with USG findings, a repeat USG with Doppler and CT scan with contrast was done to rule out any bowel etiology. The second USG revealed a thick walled cystic mass 4.6 x 3 cm in cul-de-sac suggestive of either a paraovarian or mesenteric cyst. Doppler showed normal blood flow to both ovaries. CT scan showed a cystic lesion in the posterior cul-de-sac 5.1 x 4 cm, suggestive of paraovarian cyst; both ovaries were seen separately from the lesion. Figure 1. Contrast enhanced CT scan showing heterogenous cystic lesion in the pouch of Douglas. An operative laparoscopy was performed. An enlarged hemorrhagic left paraovarian cyst 4 x 5 cm was found in the POD which had undergone 2 twists; left fallopian tube appeared edematous and left ovary was normal and seen separate from the cyst. Right tube and ovary, and uterus were normal. The cyst was untwisted, the pedicle was cauterized and cut. Figure 2. Intraoperative view of mass in POD. Figure 3. Intraoperative view of torsion of paraovarian cyst. Posterior colpotomy was done and cyst was retrieved vaginally and sent for histopathology. Surface of the left fallopian tube appeared normal; apart from mild congestion, there were no signs of rupture or bleeding. Tube was free, not adherent to the surrounding structures and tubo-ovarian relationship was maintained, hence it was preserved. Post operatively, patient had an uneventful recovery. Histopathological examination confirmed a benign hemorrhagic cyst with no evidence of endometriosis. The distinction between paratubal and paraovarian is sometimes arbitrary, with interchangeable usage of terms, as these cysts are present in the broad ligament between the tube and the ovary. A paraovarian cyst arises from mesothelium of broad ligament, also from the para mesonephric tissues and rarely mesonephric remnants. Mostly, they are an incidental finding during surgery and should be prophylactically excised because of their propensity to torsion and rapid enlargement. Torsion of the paraovarian cyst is three times more common in pregnancy. These cysts are mostly unilateral, but bilateralism has also been reported. The same sided fallopian tube and ovary being close to the paraovarian cyst, may also undergo torsion with it. Differentiation between ovarian and paraovarian cysts is difficult, not only clinically, but also on imaging. USG with color Doppler is an important tool to diagnose the viability of adnexa, by showing the blood flow in the twisted pedicle and the central venous flow. An early intervention is recommended to save the ipsilateral tube and ovary. Previously there were concerns that untwisting of adnexa might cause increased chances of thromoembolism. But at present, we have evidence that unwinding the adnexa to watch for tissue reperfusion is safe. McGovern et al reported a 0.2 % incidence of pulmonary embolism in cases of adnexal torsion, these were linked with adnexal excision and not to detorsion of adnexa. It is possible to preserve the adnexa irrespective of its appearance after de-torsion. Subsequent successful pregnancies have been reported in 95 % of cases, with no post-operative morbidity. Atal R. Torsion of paraovarian cyst resulting in secondary torsion of ovary and fallopian tube. International Journal of Obstetrics and Gynaecology Research (IJOGR). 2016; 3(8): 432-7. Steinback F, Kauppila A. Development and classification of paraovarian cysts: an ultrastructural study. Gynecol Obstet Invest. 1981; 12 (1):1-10. Puri M, Jain K, Negi R. Torsion of para ovarian cyst: a cause of acute abdomen. Indian J Med Sci. 2003; 57(8):361-2. Gopal K, Lim Y, Dobson M, Keating P, Stringfellow H. A case of torted parafimbrial cyst on MRI: case report and review of literature. Br J Radiol. 2006;79(948): e208-10. Kiseli M, Caglar GS, Cengiz SD, Karadag D, Yılmaz MB. Clinical diagnosis and complications of paratubal cysts: review of the literature and report of uncommon presentations. Arch Gynecol Obstet. 2012 Jun; 285(6):1563-9. Genardy R, Parmley T, Woodruff JD. The origin and clinical behavior of the paraovarian tumour. Am J Obstet Gynecol. 1977; 129(8): 873-80. Ghossain MA, Braidy CG, Kanso HN, Farah K, Klein-Tomb L, Trak-Smayra V et al. Extraovarian cystadenomas: ultrasound and MR findings in 7 cases. J Comput Assist Tomogr. 2005; 29(1):74-9. Barloon TJ, Brown BP, Abu-Yusuf MM, Warnock NG. Paraovarian and paratubal cysts: preoperative diagnosis using transabdominal and transvaginal sonography. J Clin Ultrasound. 1996; 24(3):117-22.